We all know the phrase “an apple a day keeps the doctor away.” So why isn’t there an equivalent rhyme for how much water we should drink? Water is arguably one of the most important items we can—and need to—add to our diet. In fact, we should think of it as a nutrient, just like we do with the vitamins and minerals we get from fruits and veggies. There are well known—and surprising—health benefits to drinking water. We’ll break those down and then dive into tips to drink more water no matter how busy you are. 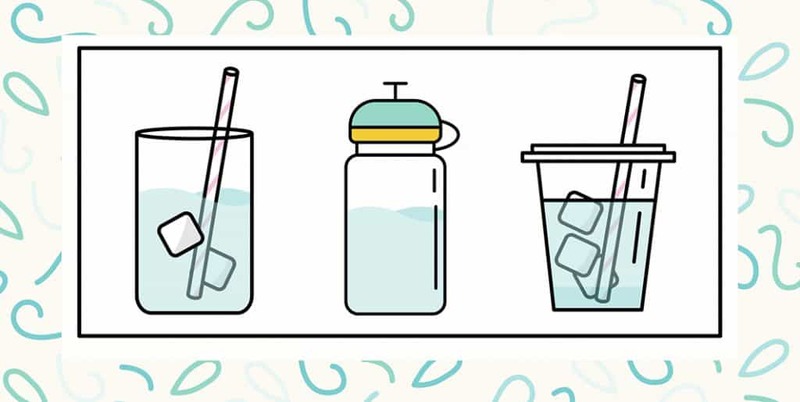 Before we explain how to drink more water, let’s talk about why it’s so essential. For starters, our bodies are composed of about 60 percent water, which is needed for digestion, blood circulation, and nutrient transportation, and to maintain a healthy body temperature. When we’re dehydrated, blood volume lowers, which forces the heart to work harder than it needs to in order to get oxygen into cells. Drinking enough water comes with some other notable benefits including energizing our muscles, preventing overeating, keeping our skin looking healthy, and maintaining normal bowel function. Additionally, drinking water literally “flushes” our bodies of things we don’t need by filtering waste from the blood and excreting it when we urinate. How Much Water Do I Need to Drink Daily? There are varying opinions as to how much water people should drink daily. One study says that 3,000 milliliters for men and 2,200 milliliters for women is more than enough. That comes out to 9 to 12 cups of water, which is a little more than the recommended eight glasses we often hear referenced. There are other factors such as body weight, age, activity level, and where you live. The most effective thing you can do is talk to your doctor about your health and how your water intake should fit into your daily routine. We know water is important but busy schedules, forgotten water bottles, and no water fountains nearby often get in the way. With this helpful list, you can cross off excuses for not drinking enough, and you’ll be happily and healthily hydrated in no time! Get in the habit of drinking an 8-ounce glass of water as soon as you wake up. Soon this practice will become routine and you won’t even have to think twice about it. Sipping water in the morning can also help aid digestion and provide a burst of energy. Having a cool water bottle has become pretty popular but it isn’t just a fashion statement. If you have a water bottle that is pretty and functional, and fits easily into your purse or backpack, you may be more apt to use it. Look for a bottle that keeps your water cold. There are ones with straws and different size mouth pieces so you can choose exactly what works for your drinking preference. This makes it so that you’re more apt to have a few glasses with your meal. Again, you can invest in a pitcher that also adds to your home decor so you’re more excited to show it off and use it! Speaking of your phone, you can also use an app to help monitor your water intake and stay accountable. There are plenty to choose from including Waterlogged, Daily Water, and Gulp. Most are free and really easy to use. Many include charts that update in real-time so you know how close you are to reaching your daily water goal. A big reason we don’t consume enough water is that it’s simply not that exciting to drink. If water just seems bland, you can easily add natural flavor. Slice up citrus fruit (lemons, limes, oranges), chop up mint, or get fancy and freeze some watermelon chunks and use them as a stand-in for ice cubes. Last but not least, try to keep a few different water bottles in key places so you’re never left empty handed. Keep one at the office, one in the car, and one on your bedside table. An extra in your backpack or purse won’t hurt either. Now you have no excuses for day-long hydration. A few changes to your routine can help turn these tips into habits, and you won’t have to constantly worry about hitting your daily water intake. Cheers to that!